This information is kindly provided by Sister Calton and Mark Astlle. D&C 52:7-8 - Almira, her new husband & Lucy accompanied men to Detroit. Almira's mother Temperance joined church. Prophecy made that 1/3 of a congregation would join the church -- Jared Carter and Joseph Wood arrived Jan. 7, 1833. Later Samuel Bent wrote of his baptism & 22 others. Zion's camp - March from Kirtland to Missouri. Lord called men to redeem Zion - gathered from Michigan? 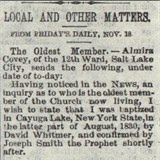 From Beth L. Campbell -- Hyrum Smith headed a division of Zion's Camp that came to Michigan to recruit members. He stopped in Kalamazoo May 10 and 11 in 1834. Joseph Smith Sr. Jr. Hyrum came to Michigan. First time Joseph Smith spoke & told story of First Vision to a large congregation of non-members. Missionary activity in many of lower counties of Michigan, including Kalamazoo (Description by John Cummings). Sister Carty of Jackson told Elder Coltharp in April 1997 that she remembers her father telling of when he was a small boy -They heard of Joseph Smith visiting in Napolean (south of Jackson - 10 miles) speaking of a vision - went to hear him. They didn't join the church then but did later. Almira (widow) arrived in Liberty, Missouri as had a number of other Michigan converts. She reported that all of the Michigan people were well, except Brother Fosdick and his family who were suffering from the ague. At this time she was living with the Curtis family, she informed her sister. Simeon Dunn received a Book of Mormon from his sister (possibly Mary) in Bellville, MI. In 1837 he named his son Mosiah. In 1839 he was baptized in Bellville. In 1840 he walked to Nauvoo to meet Joseph Smith, then walked back to Michigan to get his family, then moved to Nauvoo. He built a home which still stands in Nauvoo. In 1846 he married a 2nd wife at Winter Quarters. He settled in Brigham City, Utah. He has a descendant E. J. (& Bonnie) Dobbins who recently moved to Michigan (Battle Creek II Ward). Almira was in Kirtland, Ohio -- October 22 -- married Benjamin Covey. Temperance Mack was in Kirtland where she and her son-in-law David Dort were making preparations to move on to Missouri, having already sent their goods on ahead. She would live with Almira who was the proud mother of an infant son Enoch. Elder Mephibosheth Serrine (from New York) started his missionary labors in Lenawee county (just east of Hillsdale county) in August when he organized a church of eleven members. He worked with Orson Pratt in 1839 in Washtenaw county (north of Lenawee). He engaged in debates with the ministers of other faiths at every opportunity. December 30 - Temperance wrote to Harriet from Far West, Missouri. She was well and good spirits, also David and his family. "Almira and her child are out of health in some measure." Joseph, Hiram and Sidney Rigdon were in jail. The church has agreed to leave in the spring. " I must obey, although my heart is with my children and they are near and dear unto me, ... .I do it cheerful, knowing I shall reap in due time if I faint not . . ." "There has been many slain of our friends and some whipped . . ." Among the Missouri militia was a colonel named Don Carlos Buckland, Temperance Mack's grandson. He claimed later in his biography that he had been compelled by the governor to serve as colonel just because it was learned that he had cousins among the Mormons, and that he had to demonstrate his loyalty by accepting the commission and assisting in quelling the Mormon defenders when they surrendered. Sadly temperance wrote to Harriet back in Pontiac: "Carlos Buckland was sent here with a company of troops against the Mormons. He made us a visit. Almira and I spake very plain to him respecting his coming to drive us out of our habitations. He did not stay long and we don't know if he was offended with our plain dealing." Doubless Buckland was more worried about his business affairs than with the words of his grandmother and his aunt. He claimed that the Mormons owed him ten thousand dollars; and in order to protect his interest, he seized their stock and grain which he sold at public auction. Almira saw her husband jailed and trembled with fear when the mob threatened. Throughout this period of violence and fear, she was pregnant, carrying her son, Joseph, who would not be born until March 22, 1839. Almira wrote to her sister Harriet to tell her about the persecution, but at the same time to reaffirm her faith. "We have been requested in several letters to give a history of the proceedings of the mob in Missouri, but this is more than I can do to paint to you our feelings when surrounded by a wicked mob, not allowed to even go out of town to our farms without leave from that wicked crew. You can better judge what our feelings were than I can tell you when seeing my husband taken away to prison with about 50 others and for what? Nothing but our religion. He was left there three weeks and released as they could find nothing against him. Mother bore her trials very well. She said she never wished herself back in Michigan, and I can say for one that I have never as yet repented of uniting myself to this persecuted people but feel willing to suffer for Christ's sake. . . ."
Spring - After baby born on March 22nd - exodus from Missouri. Parley and Orson Pratt come to Detroit, Michigan to visit parents and brother, Anson. Father died soon after they left. Preached and published an 84-page pamphlet --History of the Late Persecution inflicted by the State of Missouri Upon the Mormons. The pamphlet ranks among the scarcest of Michigan imprints. Elder Mephibosheth Serrine was a leader of the Church in southeastern Michigan, and the early 1840s saw branches in Oakland, Lapeer, Wayne, Livingston, Washtenaw and Lenawee counties. Jared Carter's efforts of 1833 continued to spread the gospel to most of western Michigan. (September) Rufus Beach (from Livonia): "The cause of truth is slowly, but steadily progressing in this section of the country, prejudice is giving way to the force of truth, and some are obeying the gospel; last Sabbath two were baptized . . . ." Beach went on to complain that there were only three in that section of the country who preached "the gospel of the kingdom" even though a wide field was opened for the spread of the gospel. The following March Beach wrote to Jospeh Smith to inform him: "The saints in this section of the country are making the necessary arrangements to move up to the west this coming summer if possible, but the times are hard, and those that sell their effects will have to do it at a considerable sacrifice, but the most of them I think, see the necessity of doing so . . ."
September - Temperance wrote to her daughter in Pontiac with apologies for not having written sooner; but there had been much illness in Nauvoo. Almira's little son Joseph had nearly died of the fever. Joseph Smith, Sr., Don Carlos Smith and youngest son of Prophet died. Temperance received Patriarchal Blessing from Hyrum Smith. She sent a copy of it to Harriet and desired that each of her children have a copy of it. A portion of the blessing referred to her posterity and the division in sentiment at the present time, "the partition wall shall be broken down. By the power of Faith and exercise of Prayer and careful attention, the wall shall be diminished, and the very sentiments of your religion shall be sought after with eagerness by the residue of your children, and the desires of your heart shall be realized in the coming day. You shall be blessed with all those with whom you are acquainted, and the Wisdom of God shall rest upon you notwithstanding your advanced age, and I seal you upon unto Eternal Life as a Mother in Israel, to receive a Crown that shall be exalted, shall glitter in the morning of the Resurrection, like the Stars in the Heavens and I bless you with prosperity, comfort, and consolations in the midst of your friends . . . . if it is the desires of your Heart you have only to ask and it shall be fulfilled concerning your children, . . .I seal upon you by way of promise for the benefit of your children a promise of the Holy Priesthood in its fullness, aside from the lineage of thy daughters or thy sons that have hearkened to the gospel. . . . you have only to ask and it shall be accomplished and your mind shall be fully satisfied, and go down to your grave in peace . . ." --given by Hyrum Smith at Nauvoo, Illinois, the 6th of Sep. 1841. Jan. 20 - Conference in eastern counties-- 206 members. December-- conference in Comstock, Kalamazoo county--with representatives from Kalamazoo, Mottville, Albion, Quincy and Paw Paw. December - Temperance and Lucy remained fast friends. They stayed together at the home of Joseph Smith. Temperance still made her home with Almira, but stayed often with her sister-in-law with whom she passed the time "very agreeably," Almira now had three children, all boys, the pride of their grandmother. Frequently in her letters she asked that money be sent to her; for she still had an income from the property which her husband had left her. Stephen stopped by to visit Temperance. Both he and Harriet offered their homes to Temperance. Almira wrote to Harriet: "We all know that she would be more comfortable as to the world's goods if she would be with you but it is her choice to stay here and we are glad to have her and we try to do all that lays in our power to make her comfortable. She can enjoy many privileges and receive many blessings here that she could not receive were she not here and this is what she wants to stay here for. This may look strange to you but it is no more strange than true, and I hope the time will soon come that you will see it also. You do but little think of the blessings that are laid up for the Saints and the knowledge that is daily coming forth to those who are ready to receive it. Jan. 12 - Elder Serrine reported that in the previous six months, more than 100 converts had left to gather in Nauvoo. Visiting Church authorities created more branches in June 1844. A tabulation of the membership as reported from conference to conference would fail to indicate the growth of the Mormon church; for as soon as arrangements could be made, a true believer would depart for Nauvoo to "gather" with his brethren. Temperance living in a busy household. The Covey's had taken in a ten-year old girl, a fifteen-year old girl and two-twelve year old boys. May - Almira in a letter to Harriet revealed that Joseph Smith was a candidate for the Presidency of the United States and she urged Harriet to persuade her husband to use all of his influence to win votes for the Prophet. Almira wrote that she and her mother had been down to Joseph's yesterday. Aunt Lucy was very feeble; cousin Emma was sick with the chills and the fever; but Hyrum's family was all well. They all wished to be remembered to their cousins in Michigan. Perhaps Mother would be making a visit to them during the coming summer. June 1 - Conference held in Kalamazoo, Michigan with apostles Wilford Woodruff and George A. Smith, members of the Quorum of The Twelve Apostles, accompanied by three members of the high council, Samuel Bent, Charles C. Rich, and David Fulmer (or Palmer?) - 7 branches were represented. There were 35 elders gathered to hear instructions from the high officials from Nauvoo. A week later a conference in Pleasant Valley, Livingston County had branches from Napoleon, Jackson, and Monroe. June 15 -- Elder Serrine ordained a high priest and be the "presiding high priest over all the branches of the church in Eastern Michigan." June 27 -- Martyrdom - George A. Smith was on a mission - in Napolean & Jackson area - felt spirit of (depression, horrible) gloom & sorrow --the next morning he said "the prophet is dead"-- knowledge or feeling that Prophet Joseph Smith had died. Several days later received a letter telling of events. Temperance returns to Pontiac, Michigan and made it an extended visit remaining with her daughter Harriet throughout the year. Harriet kept her mother with her until Almira could come and get her. August 9 -- Conference (eastern) in Southfield, several elders rose to offer "appropriate remarks on the death of the prophet and patriarch". "A deep solemnity rested upon the congregation." At a conference held at Florence (Sturgis & Three Rivers--St. Joseph county) in July, James Jesse Strang appeared before the elders there to announce to them that he had been called as prophet to succeed Joseph Smith and that he had been named by Joseph to that role. This announcement was not received with enthusiasm by the conference. Elders Crandall Dunn and Harvey Green, presiding high priest, immediately denounced Strang's claims. One source indicated that Strang was excommunicated by an elders conference in Florence, Michigan. Dec. 8 - Conference in Comstock (Kalamazoo area) called together by Elder David Savage - voted to sustain the Twelve and all authorities of the Church. Almira had returned from Michigan ill with chills and fever, the "Michigan ague," she called it. In December she writes her sister Harriet: "Things have turned out quite different from what we expected when we left you." She related that the mob would not let them rest in peace, so they had decided that they would move beyond the reach of their antagonists. She said that her mother was "much engaged about going for she knows it is the will of the Lord" which is the only thing that could persuade her mother to leave that part of the country where her children lived. Harriet writes Stephen to help in persuading his mother not to go. He writes her and she writes back (toward the end of April) refusing his proposals to remain and live with him. "She says she cannot remain in a country that does not sanction the liberty of conscience and where she cannot worship in her own way. They were to start in about 10 days. May 20 - Leave Nauvoo. June 15 - They have traveled a distance of about 200 miles where they were to rest at "Camp Israel," Mount Pisga, Iowa, before going on to Council Bluffs, about 120 miles distant. Temperance was disappointed with the money and goods sent to her by her children. She needed more and would have liked to have had enough to purchase a team for her own carriage. When she was but twenty miles on the road from Nauvoo, she had received two letters from her children, apparently last minute pleas to the mother to remain behind and abandon all thoughts of the long, dangerous trip; but Temperance replied, "My dear children, I have no wish to return. My course is onward." Faithful Saints had moved from the Kalamazoo area to Nauvoo and West. May -Temperance complained that she had written four letters but had received only two from her children. They had wintered at Cutler's Park at Council Bluffs, Iowa and were considering remaining there until next spring. Almira was not feeling well, she seldom was; and her husband had been ill all winter. ". . . I am growing older as you may well know." (76) In spite of her age she was in good health. At the end of July, she wrote asking that her children send her certain supplies that she needed for the trip: ". .. . I want money by me as long as I live and then if I am in want of anything I can get it. . . . I want you to send me a good wagon, well covered, that I may have it to carry my things and sleep in while traveling, and a good team to draw it. As I expect to go so great a distance from you it is not likely that I shall ever call upon you for anything more, and my object now is to fit myself out for necessaries as long as I live, or at least for several years, and as the journey is long, I want to make myself as comfortable as I can. . . . I want all my children to send me a little keepsake that I may have it to look back upon and think of them when I am far from them." Strang settled in Beaver Island with followers; they called themselves Mormons and sent missionaries throughout the area; Strang was crowned King in 1850 and killed in 1856. Negative influence which resulted in a slow growth of the Church. Temperance made the overland trek with Brigham Young's division, which started for the West June 1st and arrived at the Great Salt Lake on September 20th. Almira wrote in October that she was feeling well. Nobody had been ill since their arrival in the valley. Mother was growing feeble; but Almira though that the cool weather would help her to regain her strength. March - Temperance wrote to her daughter Harriet to report that she was in good health and had been well throughout the trip, suffering illness only for a few weeks after the journey was completed. Almira was ill with a nervous disorder. She also wrote that the winter had been much like that of Michigan, but there had not been as much snow. However, they were told that the winter had been more severe than usual. "We have been able to purchase provisions from those who raised more than they wanted for their own use, so that we shall have enough, we expect, to last till Harvest, when we hope to have an abundance. It is a fine country for wheat, and the vegetables raised here are said to be superior to any raised in the states. . . they are much sweeter. . . . I feel thankful that I am here with those whom I believe to be the people of God. I hope you and all the rest of my children will write as soon as possible. . . ."
They suddenly found themselves right on the highway to the gold fields of California. Passing gold-seekers from Michigan stopped to visit, to deliver messages from back home, or to send word back to relatives. Almira wrote: ". . . . There is plenty of land here if you wish to come and settle here. The crops have done well this season." There was one last request for money. Temperance wished her son-in-law to settle all her affairs back in Pontiac. She wanted him to dispose of all her property, pay her half of what was due her at the time, and give what was left in the future to her children in Michigan. Almira wrote, "She says she is feeble and wants things for her comfort while she lives." Temperance subscribed her name to the letter; and Almira explained, "Mother puts her name here so that you may know it is written according to her mind." A postscript said that Mother wished them without fail to send her a carpet to put in her room next summer. Temperance died in SL valley - always tried to convince children to come and join her through letters sent back and forth (Gold Rush - people from Michigan going back and forth to California). Thomas Clobber ltr in St. Louis Luminary, 5 May 1855, p.2 We made it a rule to inquire for Saints and places to preach, but no sooner than we had informed them that we were minister of the gospel from Salt Lake, their doors were closed against us; we traveled hundreds of miles in Michigan, but obtained but one house to preach in. The fact is, Strang, the Beaver Island Mormon, as he styled himself, is sending his emissaries out to rob, steal, plunder, preaching another Gospel, but styling themselves Mormons; hence, the prejudice that exists in the minds of the people against the servants of God that are sent abroad by the authorities of The Church of Jesus Christ of Latter-day Saints. Benjamin Covey, son of Walter and Sarah Covey, was born in Frederikstown, Dutchess County, New York, March 7, 1792. He married Almira Mack, October 23, 1836, at Kirtland, Ohio. 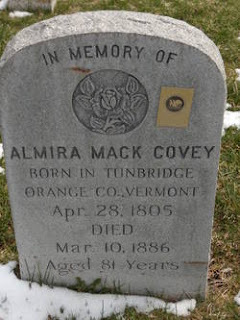 Almira was born in Turnbridge, Vermont, April 28, 1805, a daughter of Stephen Mack and Temperence Bond Mack. 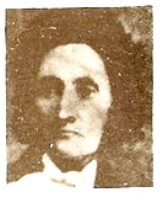 Her grandfather, Solomon Mack, owned the farm where Joseph Smith was born. She was a first cousin to the Prophet and was the thirty-sixth member of the new Church. Almira and Benjamin endured persecution inflicted upon the Saints. Three times their homes were burned by angry mobs. Their first child, Enoch, was born in Caldwell County, Missouri, August 26, 1837. Their second son, Joseph, was also born there just prior to the family being forced to leave their home under the exterminating order of Governor Boggs. Their third son, Almon, was born in Nauvoo on June 20, 1841, and died April 29, 1842. Hyrum, their fourth child, was born in Nauvoo on August 6, 1843. Charged with high treason against the state, and with robbery and murder, Benjamin was arrested and incarcerated in the Liberty Jail with the Prophet Joseph, Hyrum and several others. They were later released for lack of evidence against them. After the Prophet and Hyrum were martyred, and the Saints left Nauvoo, Benjamin, Almira, their three sons, and Temperence Mack were among those leaving. They crossed the Plains in the Lorenzo Snow Company, arriving in the Salt Lake Valley September 20, 1848. After their arrival, Benjamin began farming and pursuing his vocation, shoemaking. Benjamin, chosen to be the first bishop of the Twelfth Ward, was set apart February 22, 1849. He served seven years, until in 1856 when he was called to help settle Carson City, Nevada. Upon their return to Salt Lake a year later, the Covey family again settled in the Twelfth Ward. Benjamin died there March 13, 1868, at the age of seventy-six.